SleepMonsters Adventure Racing Reports - Patagonian Expedition Race - The Weather Is "On The Good Side Of Bad"
The Weather Is "On The Good Side Of Bad"
The 2018 edition of the Patagonian Expedition Race started today at 06:32. The teams met in the central plaza of Punta Arenas at 00:00 to catch the bus that would transport them to the race start in the wilderness of Patagonia Chile. The French team, Patagonia4 Barth was the only team that was late for the rendez-vous. The bus left Punta Arenas at 00:03. The overheated bus and the strong gusts of wind [up to 92km/hr] rocking the vehicle, soon lulled the racers into a fitful pre-race sleep. The official race photographer and SleepMonsters travelled with the RD in a separate vehicle. 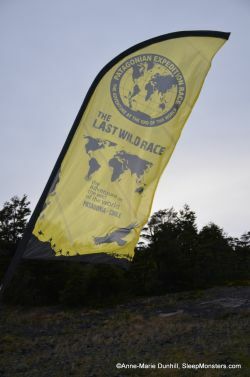 The race had been closely monitoring the weather; concerned about the impact of inclement weather on the extremely technical first trekking section. At 01:43 the RD pulled over in a gas station in Puerto Natales and did a final check of the forecast. He pronounced it to be, “On the good limit of bad,” which meant that the race would start as originally planned. The race start was in a very remote location, about 47kms North of Puerto Natales, reached by a road that should have been ashamed to call itself a road; the type of road that re-arranges your joints. The bus transporting the racers arrived at 05:43. Racers piled out of the bus and quickly prepared their race packs, in the pelting rain. Temperatures were cold and the wind driving. A low lying fog lifted briefly to reveal the snow covered mountain they would soon be climbing. It was an intimidating sight; Chelsey Magness of team Bend Racing/YogaSlackers joked that she was speechless just looking at it. On that note, the race start was given at 06:36. The weather has been difficult, with snow at 10:30 at 400m at CP1/Ruta Milodon. Teams are predicted to take 24 hours to finish this section. Team Bend Racing/YogaSlackers are travelling fast and light and hope to finish the high mountain passes before nightfall. Keep an eye on he tracking to see if they are able to maintain their estimated timings. There are two technical mountain passes on this section; Cordon Chacabuco and Cordon Prat. Both passes are part of the race route of another NIGSA event, Ultra Fiord. Cordon Prat is of particular concern for the RD. The weather will be the deciding factor; it won’t be surprising if several teams withdraw from the race on this first section and that won’t be cause for shame as this is a frequent occurrence in PER. The live tracking is now functioning so have a look at this section. Racers have been dropped in the deep end of the heart of Patagonia; wild terrain and even wilder weather. Anne-Marie is our Senior International Reporter covering World and European Champs and major races worldwide. She is a fluent French speaker and her insightful interviews of racers and organisers are a vital part of SleepMonsters editorial coverage.